Cherry's SPOS keyboards are fully programmable and provide a full QWERTY key layout in a compact 14-inch form factor, combining maximum space efficiency with uncompromised alphanumeric data entry. They offer plug and play configuration for all common POS features and unique function enhancement via Cherry Tools virtual programming. The Cherry Tools software also allows for quick product set-up and program configuration, including remote installation. Cherry also offers comprehensive UPOS support for Windows and Linux. As with all Cherry POS keyboards, the new SPOS product line is fully compatible with Microsoft's (tm) new WEPOS operating system. SPOS keyboards are available with and without a touchpad. 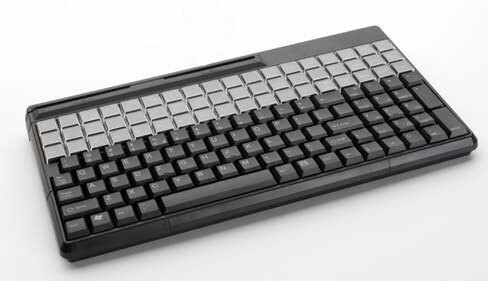 The standard model (G86-61410) provides a 135-position key layout with 60 relegendable keys. The touchpad model (Part# G86-61411) has a 123-position key layout with 54 relegendable keys for easy layout configuration and quick function calls. Both products offer free programmability of all key positions in three layers and feature a high performance 3-track magnetic stripe reader. The freely programmable headers and terminators and the flexible parsing of data make the SPOS keyboard suitable for nearly any application. The Cherry G86-61411EUADAA is also known as CHE-61411EUADAA	or G8661411EUADAA	.